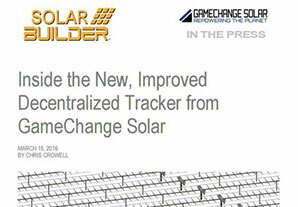 NEW YORK, NEW YORK – May 16, 2016 – GameChange Solar today announced that its training and field support team has over 1.2GW in experience with single axis trackers. “Tracker customers are calling for tracker vendors to provide superior levels of customer training, support and commissioning, and do not want to pay expensive cost adders for these services. We have built a team of field professionals with over 1.2GW in experience installing and training crews regarding single axis trackers.